From the Moo Booth to the Cattle Barn to the Coliseum and everywhere in between, beef and dairy cattle can be found all 12 days of the fair. If you’re looking to see cattle of every color and breed, make sure to stop by the Cattle Barn. Sunday, Aug. 26: 8 a.m. to 5 p.m. Note early closing time for Livestock Arrival & Departure. Thursday, Aug. 30: 9 a.m. to 5 p.m. Note early closing time for Livestock Arrival & Departure. Monday, Sept. 3: 8 a.m. to 5 p.m. Note early closing time for Livestock Departure. The 4-H Cattle show takes place the first four days of the fair, open class moves in the middle four days, and FFA takes over the last four days. Want to learn about cattle and the importance of their place in agriculture? Don’t miss a trip to the Moo Booth in the Cattle Barn. See cows being milked, learn how to hand milk a cow, participate in a butter sculpting contest and so much more. 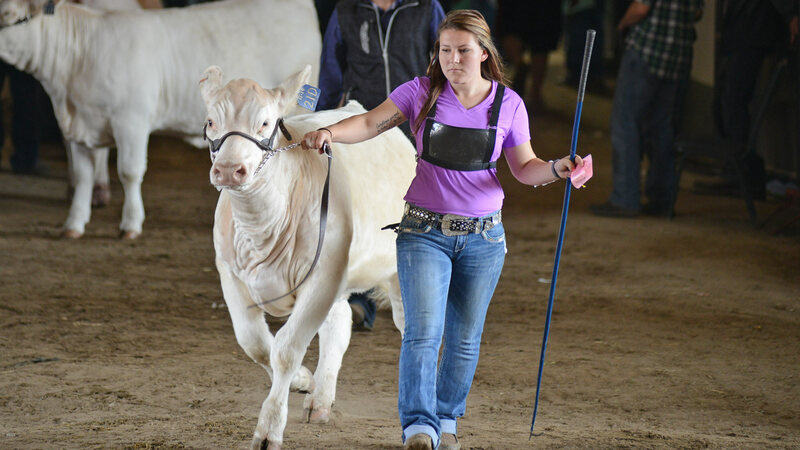 Finally, see the best of the best cattle be judged under the bright lights of the Coliseum. Be sure to check out the daily schedules for hours of where and when to find our a-moos-ing friends.